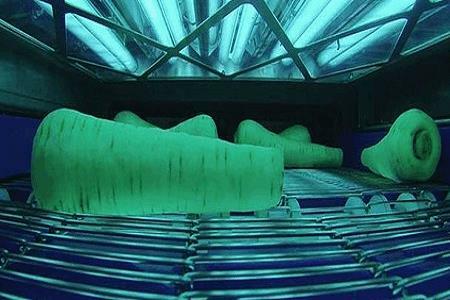 In addition to their use for Point-of-Use Water Disinfection, UV-C LED-based solutions have now been demonstrated to offer novel and unique approaches to food production sanitation. Most people are familiar with the use of germicidal ultraviolet light (UV-C) for sanitizing the air we breathe in buildings and disinfecting the water we drink at home. UV-C, indicating a band of wavelengths falling between 200 nm and 280 nm, has demonstrated the ability to inactivate pathogenic bacteria, viruses, cysts, and spoilage mold and yeasts infectious to human health for nearly a century. Needless to say, UV-C’s anti-microbial effects on germs and the benefits of its use are well established. At a cellular level, photons of UV-C light are absorbed by microbial DNA causing sub-lethal damage to DNA repair systems, rendering the pathogen incapable of reproducing. Hence, multiplying or colonizing a host, and causing deadly infections. Engineering the efficient delivery of germicidal ultraviolet light and validating its efficacy is practiced world-wide for a variety of applications. Deployment of effective products has become even more important now, since bacteria is becoming antibiotic resistance and global pressures on the environment are stressing food and water supplies. The conventional way of generating UV-C light is using high voltage, arc-discharge mercury or amalgam lamps that can generate photons solely at 253.7 nm. These quartz glass envelops lamps are effective in disinfection and are generally affordable and reliable. They are proven-in for their intended applications.